New Long Island Rail Road timetables will go into effect on Monday, November 16 with the promise of extra service to meet greater travel demands during the Thanksgiving, Hanukkah, Christmas and New Year celebrations. Photo by: MTA LIRR Facebook. Long Island, NY - November 10, 2015 - New Long Island Rail Road timetables will go into effect on Monday, November 16 with the promise of extra service to meet greater travel demands during the Thanksgiving, Hanukkah, Christmas and New Year celebrations. The new schedule also includes an additional eastbound "Sundown" train on Friday afternoons on the Far Rockaway branch for those who must be home before sundown for religious purposes. There are also adjustments to departure and arrival times during off-peak hours and on weekends to accommodate scheduled track work on some branches (Babylon, Huntington/Port Jefferson and Port Washington). The new timetables remain in effect through Sunday, March 6, 2016. Friday-only sundown service will resume on the Far Rockaway Branch on Friday November 20. Sundown service trains leave Atlantic Terminal in Brooklyn at 3:05 p.m. and Penn Station at 3:07 p.m., connecting at Jamaica to the 3:31 p.m., arriving in Far Rockaway at 4:05 p.m.
Additional early afternoon trains will operate on Wednesday, November 25 for customers seeking a head start on the next day’s Thanksgiving Day festivities. On Thanksgiving Day, there are extra trains to get you to the Macy’s Thanksgiving Day Parade and extra trains to get you home when the parade is over. On Friday, November 27, otherwise known as Black Friday, traditionally one of the biggest shopping days of the year, the LIRR will operate on a regular weekday schedule. On Saturday, November 28 and Sunday, November 29, the Railroad will operate on a regular weekend schedule. As a bonus, off-peak fares will be in effect for the extended Thanksgiving weekend from Thursday, November 25 through Sunday, November 29. Additionally, the Railroad’s Family Fare Discount will be in effect all four days. That means kids ages 5-11 (limit of 4 children) can ride one-way for $1 when accompanied by a fare paying parent or guardian. Weekly and monthly ticket holders pay just for the kids and, as always, children under 5 ride free. Beginning the weekend of November 27 and running through the first weekend of the New Year, the LIRR is adding service to meet the holiday demand. On Saturdays and Sundays, four additional trains will operate westbound between 9 a.m. and 1 p.m. and four additional eastbound trains will depart Penn Station between 4 p.m. and 8 p.m. providing Long Beach customers with half-hourly service during busy weekend travel hours. One eastbound train has been added to the overnight schedule on Saturday and Sunday between Penn Station and Huntington. The train will leave Penn Station at 2:44 a.m.
One eastbound train overnight has been added on weekends from Penn Station to Babylon. 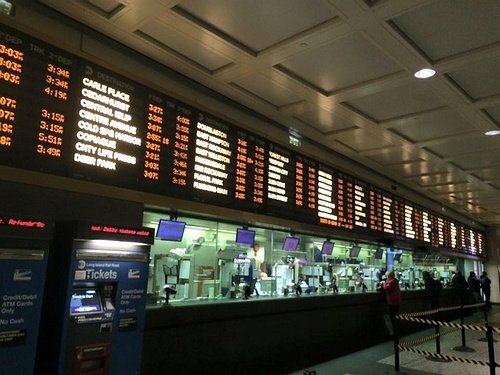 The added train will leave from Penn Station at 1:13 a.m.
Keeping the LIRR’s infrastructure in a state of good repair means changes to the train schedules during off-peak and on weekends, the travel period that impacts the fewest customers. Timetables going into effect on November 16 include adjusted arrival and departure times for scheduled track work on the Babylon, Huntington/Port Jefferson, and Port Washington branches. The work on those branches impacts some off-peak and weekend Montauk, Oyster Bay and Ronkonkoma trains. Customers can pick up a copy of their new branch timetable for the impact on specific trains or view the timetables online. Customers can pick up a copy of their branch timetable or any Special Branch Timetable at stations or terminals or find it online. They can also contact the LIRR’s Customer Service Center by calling 511, the New York State Travel Information Line, and say: Long Island Rail Road. If you are deaf or hearing impaired, use your preferred relay service provider for the free 711 relay to reach the LIRR at 511. Subject: LongIsland.com - Your Name sent you Article details of "New LIRR Train Schedules Go Into Effect Monday, November 16 Highlighted by Extra Service for the Upcoming Holiday Season"